ANDREW MARTIN: The Railway Detective Goes to War! Jim Stringer is such a well-defined and convincing character that he could have lived in any period, or taken up any career. So why did you set him in the Edwardian era, and why working on the railways? ...As for the railways, I like atmosphere, and a steam engine is a literal generator of atmosphere. You’ve carved a specific niche for yourself, and won a very loyal readership as a result. But how tricky has it been to strike the balance between those who crave technical detail and those who see it merely as window-dressing for the plot? My books are not pure plot. I’m interested in mood and language as well – and historical detail can be used to create both. I also like the idea of men talking about the jobs they do, rather than endless psychological introspection. 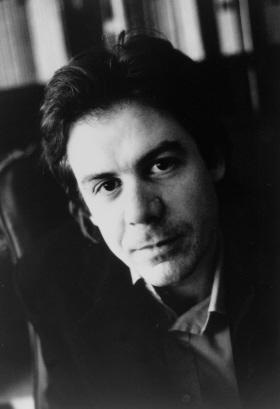 I like the idea of creating a world that is strange to the reader, but ordinary to the inhabitants of that world. Do you research your books first and then write them afterwards, or do the two processes take place in tandem? After a certain point, you just have to stop the research and start writing, either because you’re so inspired that you must begin the story, or because the money’s run out. I’ve read elsewhere that you use novels of the period to immerse yourself in the language and manners of the time. Was there a specific book (or books) that helped you absorb the rhythms and preoccupations of life in the New Army? I read a lot of factual books, the best of which is probably ‘The Great War and Modern Memory’ by Paul Fussell. It’s about the cultural shift that occurred, the way that reality took over, so that people stopped speaking of a soldier’s ‘breast’, but spoke of his ‘chest’. For rhythms of speech in my Stringer books, I would read people like Arnold Bennett. I didn’t really read any First World War NOVELS as such, although I have done in the past. Today we view the Edwardian age very much as a prelude to the Great War. When writing the earlier novels, did you always have at the back of your mind the knowledge that one day Jim, and you, would have to address the conflict? Two or three books in, then yes I did, and the War is foreshadowed in the one called Death on A Branch line, which has a theme of espionage. It’s set in the very hot summer of 1911, which is always taken to be the calm before the storm, and which is also, incidentally, the period in which The Go-Between by L.P. Hartley is set – that’s a terrific book, with all the tension of a good thriller. 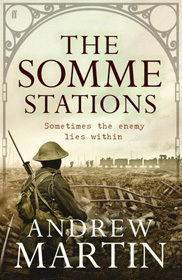 Each location in The Somme Stations is made vivid and believable for the reader, be it York station, the Spurn or Burton Dump. How do you go about visualising each setting, and how important are these backdrops to your plotting and characterisation? I don’t think you can write a scene unless you know EXACTLY what the backdrop looks like. Only then would you have the confidence to begin. And since the only constraint is your imagination – since there is no production budget, as on a film – then why not have some strange and dream-like locations? I can’t understand writers of contemporary fiction, who will set whole scenes in, say, a McDonalds. Were you tempted to have Jim join the Military Police? Yes, but I think you’d lose sympathy. I mean, I’m sure the military police did a great job in the War, but they were not popular with the men. I was particularly fond of the Butler twins, and really enjoyed their odd and intimate banter. When you’re writing dialogue do you speak it out loud or even act it out? You’d certainly speak it out in your head, and sometimes I have found myself suddenly speaking dialogue out loud while writing in a library, which is embarrassing. I think you succeed brilliantly in bringing to life a largely unknown aspect of the fighting on the Western Front. However, given the existing wealth of First World War literature were you daunted at taking it on? Well, I just put my head down and got on with it. Every subject’s been done before. You can never have a clear field to yourself. I think a lot of aspirant novelists are put off by the sheer weight of what’s gone before. They think, ‘I’ll never be as good as so-and-so...’ You have to be more cavalier than that. The novel ends in 1916. Does that mean we can look forward to Jim’s continued involvement in the war in your next book? Which other series of historical crime fiction do you wish you had written? Do you see yourself, in the future, returning to contemporary crime, or branching into non-crime historical fiction? Are you not tempted, for instance, to make greater use of your background as a barrister? I have an idea for a contemporary crime novel, and I’m trying to work that up at the moment. I think I’ve found a way of avoiding what is to me the main pitfall of contemporary fiction, which is globalisation. I don’t want to have people going into Starbucks, saying how great Madmen is, sending Tweets and so on. All those corporate words are just so much lumber – dead words. ** Andrew Martin’s wry look at men and housework – How To Get Things Really Flat: A Man’s Guide to Ironing, Dusting and Other Household Arts – was recently serialised on BBC Radio 4.